This photo is an install of an iron entry door done in Houston, TX. This entry courtyard now looks like it came straight out of a storybook thanks to this door replacement. 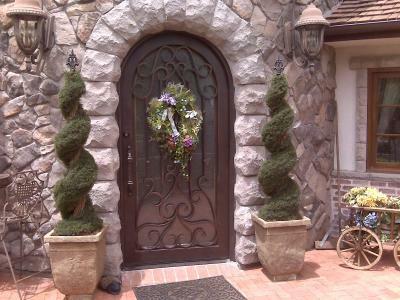 This custom iron door fits perfectly along the arched stonework and brings out the character of the home. To complete this picturesque courtyard we can install a custom wrought iron gate that will provde security as well beauty to the property. Signature Iron Doors can provide numerous solutions for any of your iron needs and we take pride in our product quality and fantastic customer service.